Yes, clearly your name, so do buy it and clean up the pommel! PS: forgot to ask - do you have a photograph of the 1 E or 1 F 1550 example? What was the source? Here is the original listing that I had made of your data; you will see that you have 1550 twice, as 1.E and as 1.F. I annotated with # to indicate duplicate entry. I don't have photo or a source for this one, and I was hoping that you could clarify it. You are absolutely correct about the zero before the 3-digit numbers; my spreadsheet did not want to take the zero when I did horizontal entries (which is what I copied from), rather than vertical ones (as below). I shall edit my post above to include the zeroes. Thinking again about the issue of a zero before the 3-digit numbers, can we reasonably infer that the first serials would be 0001-0009, 0010-0099 and that the last would be 9999 ? Many thanks dear friend and mate! Yes, I was assuming they went that 0001-9999 way - as do WW2 German makers' sequences but those are followed by a letter. I'll let you do the maths, but if we have from 1 A to 1 F before the serial, with 1 F finishing at 2103 +, what is going on? 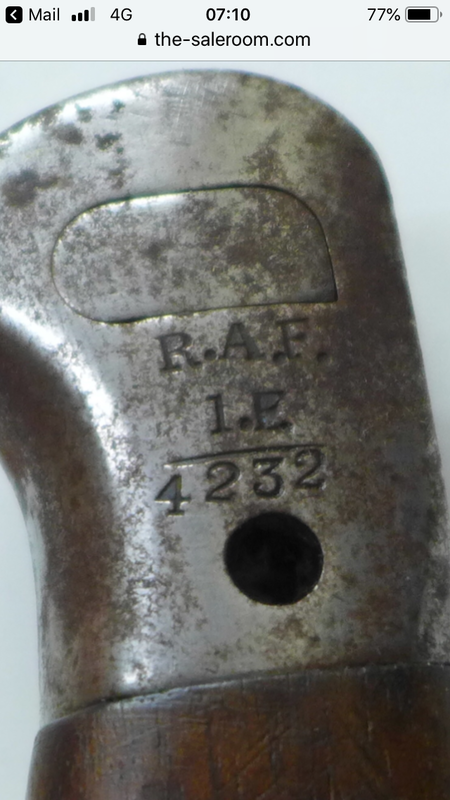 I cant't see it as RAF regiment numbering, but as individual commands - but can't work out how! 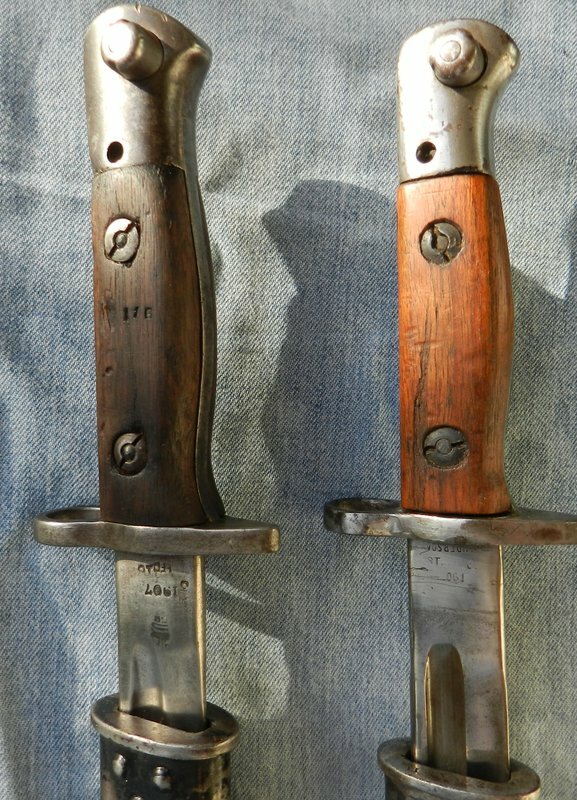 Either way, all seem to be WW1 period P.1907 bayonets - so justifiiably discussed here - scrubbed of their marks almost completely and then re-issued. 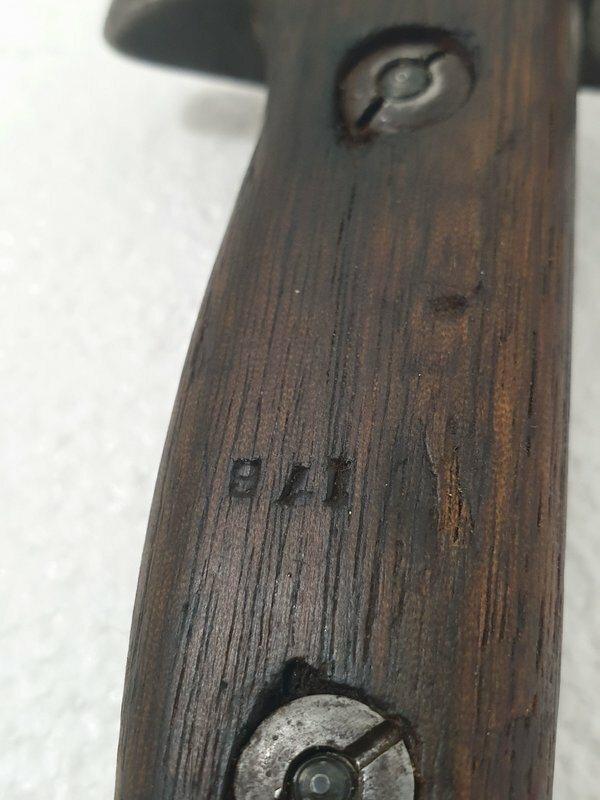 Do you know of any that have 're-issue' marks after the one I posted two days ago and in post no.27, which looks to be (19)22? PS: currently helping older boy (12) with homework... Have you ever heard of 'synovial fluid'? What DO they learn these days. 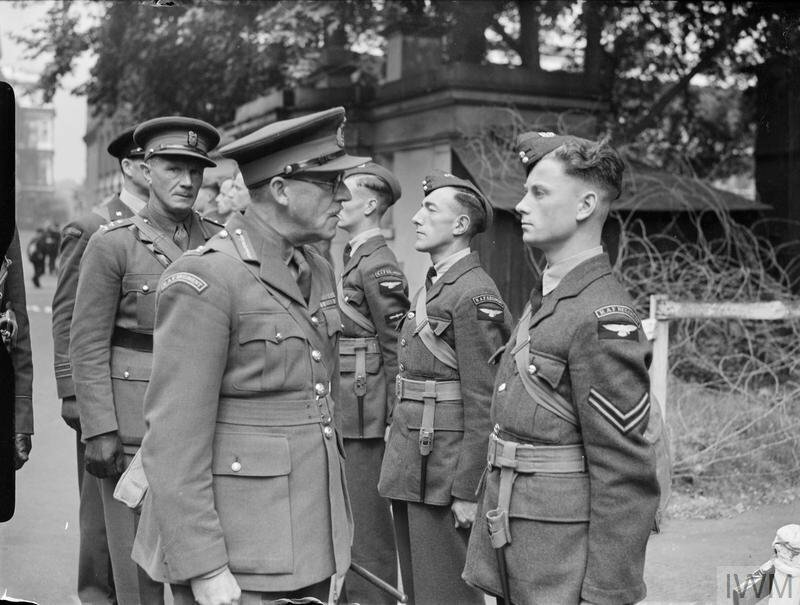 This as an IWM photo of RAF Regiment 1942-45. 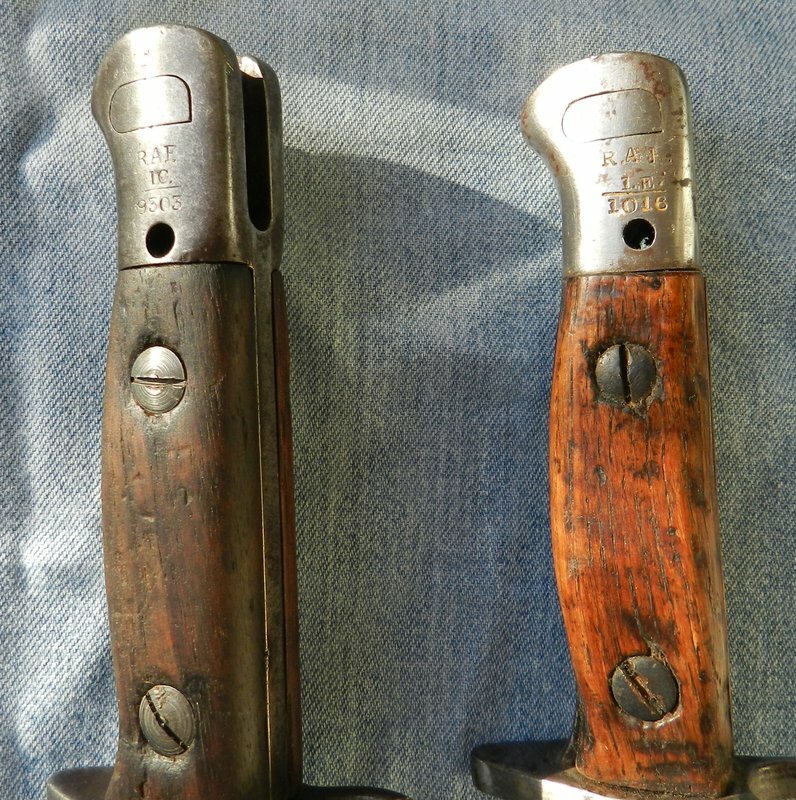 The men carry the scabbard of the pigsticker bayonet for the SMLE but unusually hanging at the front rather than the rear. Yes, I was assuming they went that 0001-9999 way - as do WW2 German makers' sequences but those are followed by a letter. I'll let you do the maths, but if we have from 1 A to 1 F before the serial, with 1 F finishing at 2103 +, what is going on? I cant't see it as RAF regiment numbering, but as individual commands - but can't work out how! These serials that we have noted are purely random numbers; “1.F. finishing at 2103” is just the single, random serial that we have located for the 1.F. tranche. If you inspect your original listing, above, you see that entries range 0-4 for any tranche, so a single entry is not that unusual. Re-inspection dates noted so far are ‘17, ‘18, ‘20, ‘21, ‘22 (3x), and ‘25. I have some musings on the “commands or organizational structure ”, which are off topic, so will send shortly in PM. 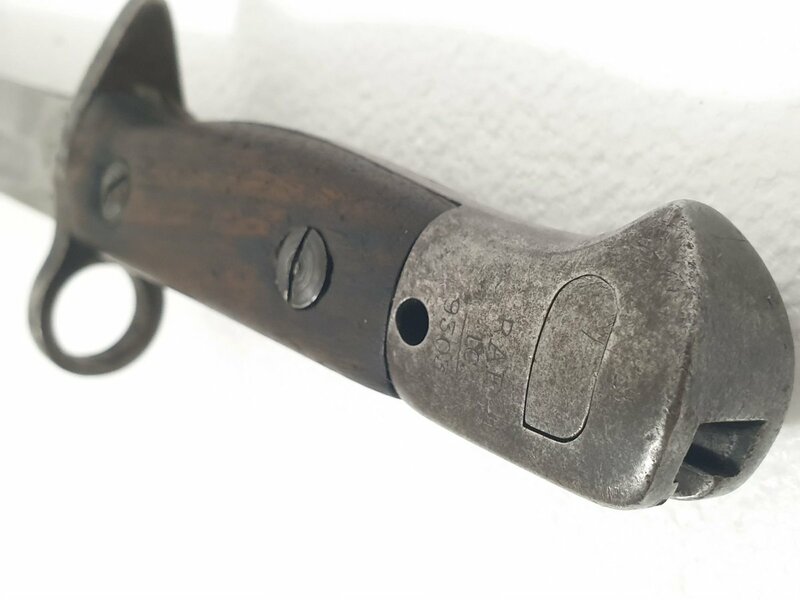 The spike bayonet scabbard shown here is NOT for the SMLE (by this point known as the rifle No1) but for the Rifle No4 (never referred to as an SHtLE or SMLE as it was introduced after the term had ceased to be used). They also have interesting belts on - they do not appear to be 1937 pattern belts - perhaps the Air Ministry specific 1925 pattern? (SEE HERE) As the Karkee Web site notes Belt and bayonet only (and in this case carrying a respirator) was worn as "walking out" dress. Scrolling back through this thread shows that the possible duplication of 1550 first occurs in your list in post #14; hence my uncertainty. Of course, it is possible that 1550 is found as both a 1.E and a 1.F but could you check your original notes. Of course, you`re technically correct! Apparently it also fits the MkV Sten. I used the bayonet with the No 4 during my NS years and it was generally referred to as an SMLE - incorrectly it seems! Thanks JMB for your as usual valued comments. I'll look at the PM later, as a bit busy here, likewise with checking my files which might be on my old computer... . Well if this one not sold by Monday, maybe I can get it Thursday - pay day! In the meantime, better photographs, I hope. it is is certainly an I.C. Any chance of identifying the maker from those inspector stamps? Very probably RSAF, from the crown/EFD/35. 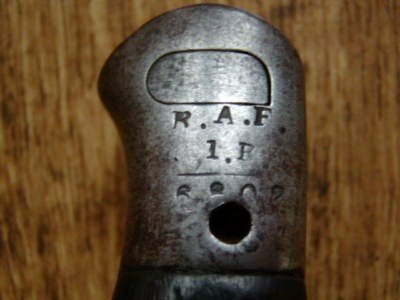 I have only recorded that, or crown/EFD/51, on the Enfield P.’07’s. 'Tis indeed " R.A.F. / I.C. /9303"
Left ricasso - "3 / 16", possibly "3 / 18" - and "EFD", so bang on there! Right ricasso - top two stamps not clear, but a "'22" 're-issue' mark above the "Crown / EFD / 35". 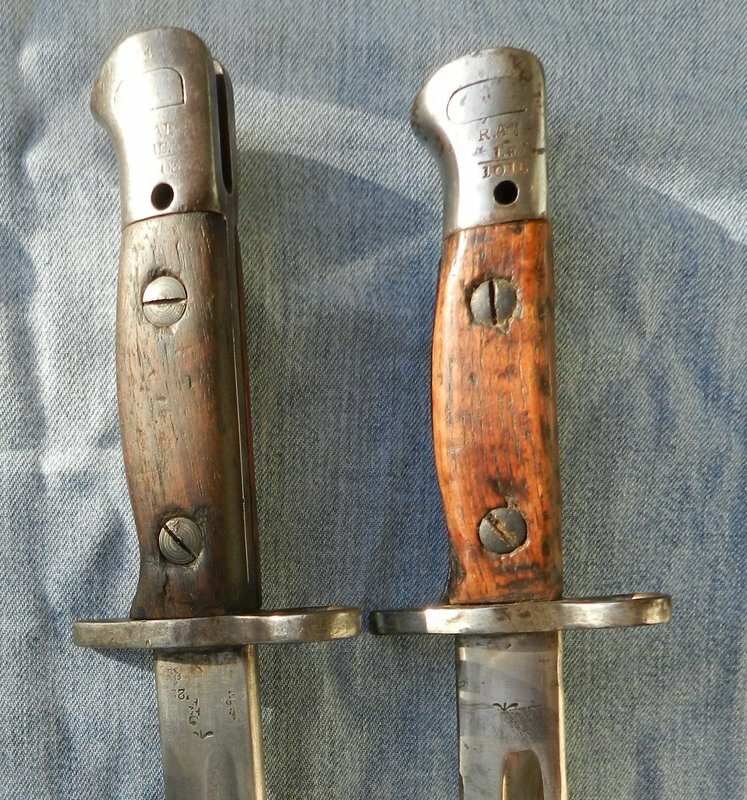 So, when were these ex-WW1 bayonets assigned to the RAF, and what are these unit codes? A "Chapman and dated 3/18. 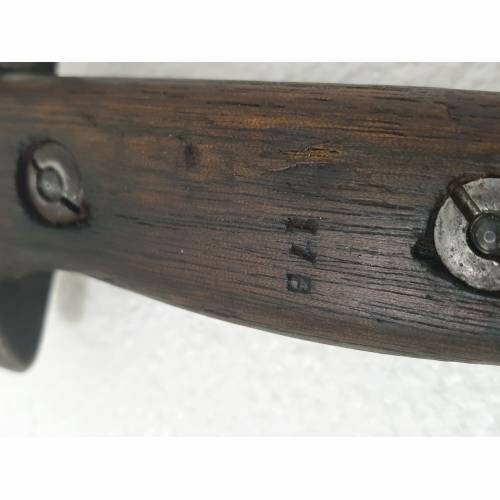 There is also another date on the blade 1941". 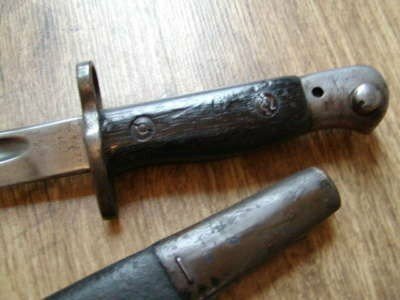 ... "The steel mounted leather scabbard is in good condition, the mounts have been Kahki painted and the leather body is marked CLIFF, WALSALL and is dated 1941." Text and photographs reproduced here for research and record purposes. 1st page, second from bottom. Many thanks Dave! 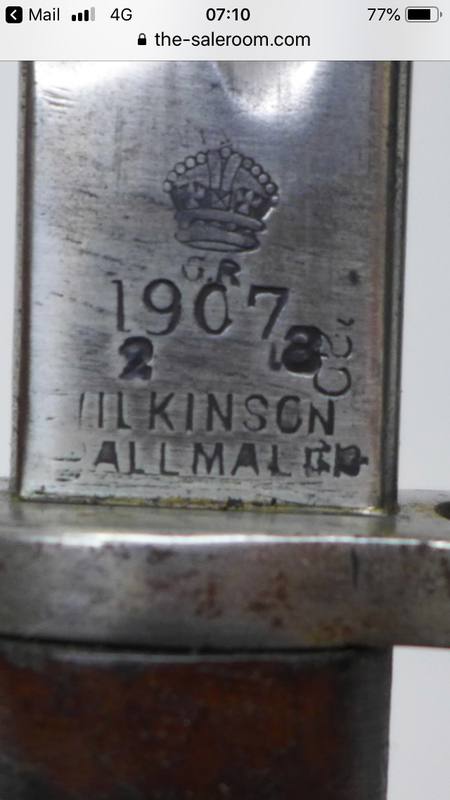 A WILKINSON / PALL MALL also! So, R.A.F. 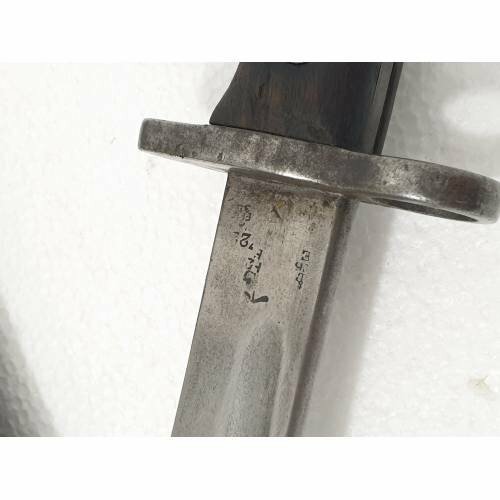 / I / 5806... And a nice RAF marked scabbard also! Thanks for those updates; have just logged them into the database, and total is 37 or thereabouts. I read it as 1. 5809 ??? 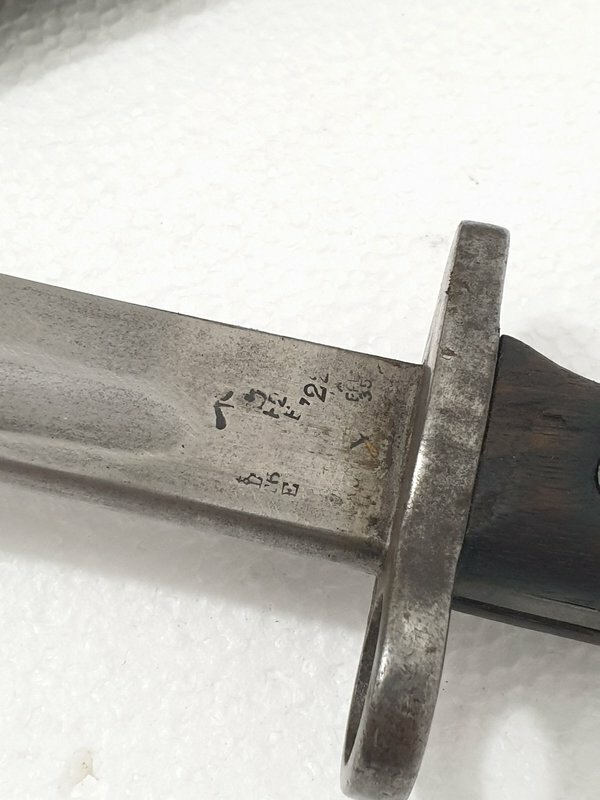 Thought it might help build the bigger picture, I read it as 1/5809 also, and also nice to see a scabbard marked like that. 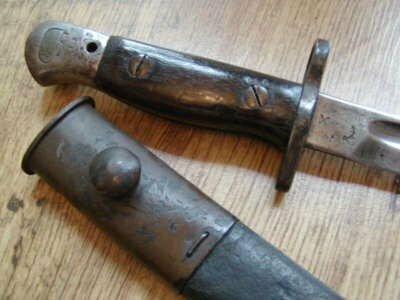 A very reasonable example, scabbard and all 😀. JMB, summer holiday plans still not sorted out, but if I can get to somewhere in GB to sort this marking system out I will! Is 1509 your final offer? I think that you should take two eye-drops and call me in the morning! Morning all, here’s one to add to your database gentlemen , sadly not mine.